*Polymer Compound Resin (the 2-bottle kit such as Envirotex-lite. One bottle is your resin, the other is your catalyst). Since Halloween is almost here, I thought I would share a project with you all. This is, by the way, an actual real-life Halloween Punch. When you mix Orange Kool-aid with Purple Kool-aid (with Ginger Ale), you get a black Halloween Punch. In a paper cup, pour one part resin to one part catalyst, very equally. Add to this just the tiniest touch of Black Opaque Color. STIR THOROUGHLY. 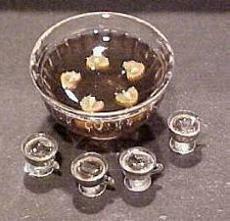 Carefully pour the catalyzed mixture into your punch bowl and drizzle mixture from the tip of a toothpick into cups. Add "ice cubes" and then set aside to cure and let harden for at least 24 hours. OPTIONS: You may want to place a mini-skeleton, candles etc. in your punch to spruce it up. Do this as soon as you have poured the resin mixture, then add the ice cubes.